China – Nov. 2011 - Dymek Chinaparticipated in the 14th national symposium on magnetism and magnetic materials in Hainan last November 23 to 28, 2011. 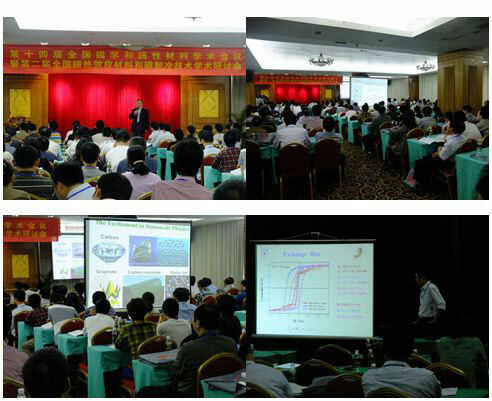 The event concurrently held the 2nd National Symposium on magneto-caloric effect materials and Magnetic refrigeration technique. This conference was called to gather China magnetism experts and to offer a platform for them to communicate better. Many domestic customers of Micro Sense VSM, like Institute of Physics of the Chinese Academy of Sciences, NJU and CNU shared their scientific achievements during the meeting, based on the experimental data they got from Micro Sense VSM. Dymek took the second participation as exhibitor in the symposium and tackled various technique questions from customers, such as CISRI, Nanchang Aviation Aerospace University and others. Our colleagues had the chance to discuss in depth the significant issues surrounding equipment usage with our current clients. The effort is aimed at further promoting our relationship in the magnetism market. Magnetism symposium,,held every three years, is normally the biggest scale symposium, and with most participants in China. Hainan’s was held by CIE, CPS, the Chinese society for metals, CSRE, Chinese Society for Measurement and China Instrument and Control Society.